Here’s a little interview with Mr Fuseini Amadu, Chief of Galiba Village, 75 years old, who has just had a second cataract operation, thanks to Hands International and the MCEC. 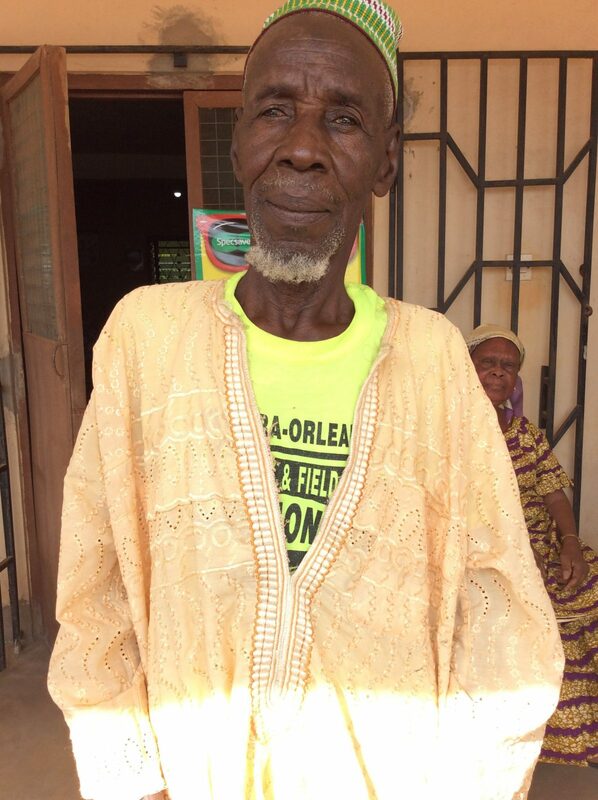 Nana Fuseini used to live in Yendi, Northern Ghana, where he farmed yam, cocoyam and maize. He is a member of the Dagomba tribe and his first language is Dabani rather than the Twi spoken by local people. He came south to Ashanti to find an easier life about fifteen years ago, when climate change made farming in Yendi very difficult. He has two wives who bore him fifteen children, but five died. He is a Muslim. In Galiba, he also farmed and his crops included maize, yam, groundnut and cow peas. As he got blinder he stopped working as he was afraid he’d hurt himself. Also, he stopped being able to distinguish between weeds and the crops he’d planted. He spent one year at home. Now he is back on the farm. Ashanti Development operated on one eye some time ago. Now the other has also been operated on. He says both operations were successful, though the second eye looks as if it has hairs in it. He prays for prosperity always to follow the donor. He prays God to bless everything he does. He says he is a human being so he can only say his thanks, but he knows that God will hear them.